A charming broadside promoting Martha's Vineyard as a vacation destination - the only known example. 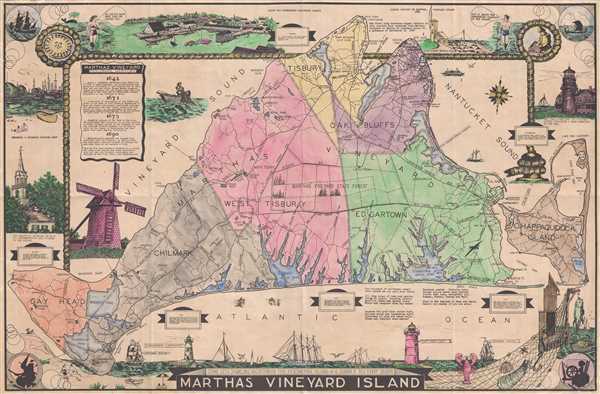 This is L. H. Parker's c. 1935 pictorial map of Martha's Vineyard. The map depicts the entirety of Martha's Vineyard from Gay Head and Gay Head Lighthouse to Chappaquiddick Island and from the West Chop Lighthouse to the Atlantic Ocean. Each of Martha's Vineyard's six townships are illustrated and labeled, as well as shaded different colors to allow for easy differentiation. Numerous locations throughout the island are also labeled, including lighthouses, ponds, beaches, bays, and points. Roads crisscross the island and Martha's Vineyard State Forest dominates its center. Charming vignettes frame the central map, illustrating towns, buildings, and local trades, such as fishing and a lobsterman hauling in his catch. A wonderful depiction of the Gay Head Light is situated along the right border, while a fisherman's net and a lovely beach scene provide the frame along the bottom border. This map was created by L. H. Parker and published c. 1935. The map appears to have been reproduced in c. 1960, but we have identified no other examples of this original large format edition. Very good. Even overall toning. Backed on archival tissue for stability. Blank on verso.